by Maev Kennedy, guardian.co.uk, March 7, 2011. Pieces of carved ivory from ancient Assyria. Despite the best efforts of Agatha Christie and her pot of face cream, many of the ivory treasures just acquired by the British Museum from the Assyrian city of Nimrud are still scorched by the fire that brought one of the great palaces of the ancient world crashing down on top of them 2,600 years ago. A fundraising appeal that brought in £725,000 in six months from 1,800 members of the museum friends, along with grants from the National Heritage Memorial Fund and the Art Fund, raised almost £1.2m to buy the ivories, discovered in the 1940s by the archaeologist Max Mallowan, Christie's second husband. 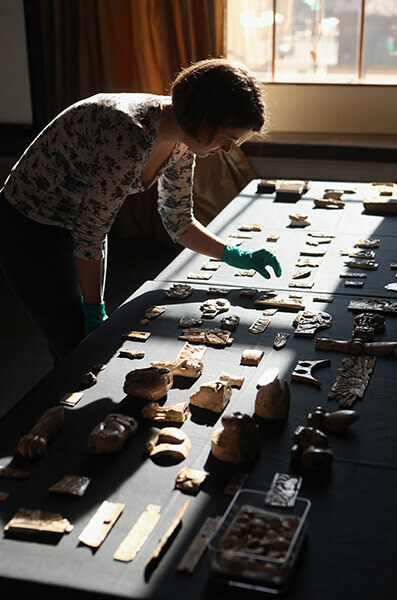 The ivories have been in storage since 1963, first at the Institute of Archaeology and for the past 25 years at the British Museum, and never seen by the public. "These are astonishing objects, not just very beautiful but with many stories to tell us about the culture in which they were made," said Neil MacGregor, director of the British Museum. Some of the most beautiful pieces will be shown off in a small exhibition at the museum next week. Agatha Christie knew the carvings intimately. After the crime writer's disastrous first marriage, her second was very happy: she strongly recommended marrying an archaeologist since he would regard a woman as more beautiful and interesting as she aged. Christie spent long periods on site in the eight years Mallowan spent excavating the enormous site in northern Iraq. He built her a special writing hut, where she wrote parts of They Came to Baghdad and A Pocket Full of Rye, but she also helped with site work, including cleaning the beautiful ivories using a pot of expensive face cream. The museum conservators who have been working on them wouldn't recommend the technique, but it appears to have done no harm to the tiny sphinxes, lions, serpents and flowers, once inlaid with precious stones or covered with gold foil, which originally completely covered elaborate pieces of furniture. The intricately carved ivories, some no larger than buttons, were regarded as one of the finds of the century, from one of the legendary cities of the ancient world. The city was already ancient when Shalmaneser III built a 200-room palace surrounded by a five-mile wall in the eighth century BC, adding to the temples, palaces and giant ziggurat built by his father. It was sacked by the Medes and the Persians in 612 BC. Shalmaneser and his ancestors never lacked enemies. Their own boasting inscriptions recorded not just the cedar wood, gold and silver that decorated their palaces, but how they flayed or cut out the tongues of their captives, and left rivers flowing with their blood. Nimrud was first excavated by the archaeologist Henry Layard in the 19th century, and the giant winged stone bulls and lions he brought back to the British Museum caused an international sensation. He had dragged them across the desert by ox cart and shipped them down river on rafts supported by thousands of inflated goat skins, and they are still some of the most spectacular objects in the entire vast collection. Since then the museum has acquired pottery, inscriptions and metal work from the site and the greatest Nimrud collection in the world is now in Bloomsbury. Mallowan had yearned to work at the site, but it took him until 1949 to get the necessary permits to excavate with the British School of Archaeology in Iraq – now the British Institute for the Study of Iraq, which has sold a third of its collection to the museum, and donated another third. When he hit the stores known as "the ivory room", thousands of carvings poured out of the ground and were then divided between the archaeologists and the museum in Baghdad. 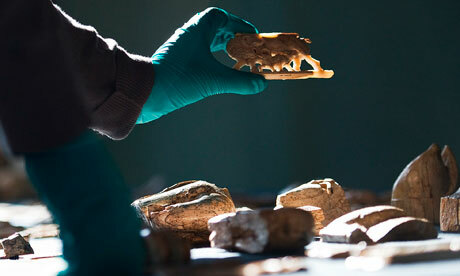 More ivories were found at Nimrud - brought there either as booty or luxury imports - than at any other Assyrian site. The British Museum curator Nigel Tallis believes the fragile ivories may have survived because many of them, already centuries old, had fallen out of fashion and been put into store long before the sack of the palace. Most had been stripped of their jewelled inlays and gold foil covering. Many of the pieces which remained in Iraq were damaged in the invasion. John Curtis, keeper of the Middle East collections at the museum, recalled seeing broken ivories trampled underfoot in the ransacked museum in Baghdad, and others placed in a bank vault were damaged by flooding after a shell hit the building. The British Institute - which needed the money to continue its work of organising lectures and seminars and sponsoring Iraqi scholars to visit Britain after it lost all its funding from the British Academy - has kept back some of the ivories, and hopes eventually to return them to Iraq. Scholars are itching to get their hands on the ivories after the exhibition. Some of the pieces have notes on the back in ancient Aramaic, which appear to be the Ikea flatpack instructions of almost 3,000 years ago on how to assemble the furniture. • This article was amended on 9 March 2011. The original said a fundraising appeal brought in £750,000 in six months. This has been corrected.